If there is one thing AO enjoys – it is music. He loves all kinds of music, and when he can work on a piece that brings two loves together like music and painting – he gets very excited about the project. The “Vedder” was one of those pieces. This unique commission piece, and the first complete musical artist piece of AO’s unique style, is a not only a credit to his growth as a designer, but a glimpse at what he can do with non-sports subjects. Even with AO’s limited color pallet, there is a high level of artistic execution with his brush strokes and color usage. He takes on color and expands the values of each to deliver his creative message. “The challenge of the work does play a part in my energy in the piece, but the subject matter plays a bigger part because if it something I love like sports, religion, music, action or just an awesome client, it makes me push myself even more”, says AO. Eddie Vedder, lead singer of the rock and roll band – Pearl Jam, have been together since the early 90’s. The feeling Vedder puts on paper and then into song provokes a feeling in people, that other artist can only wish for. The words and music this man and his band put out in the 90’s and even today, is nothing short of genius. Eddie Vedder took a shot one day with a group of guys he hardly knew in Seattle WA, and the music they created changed lives and made history. 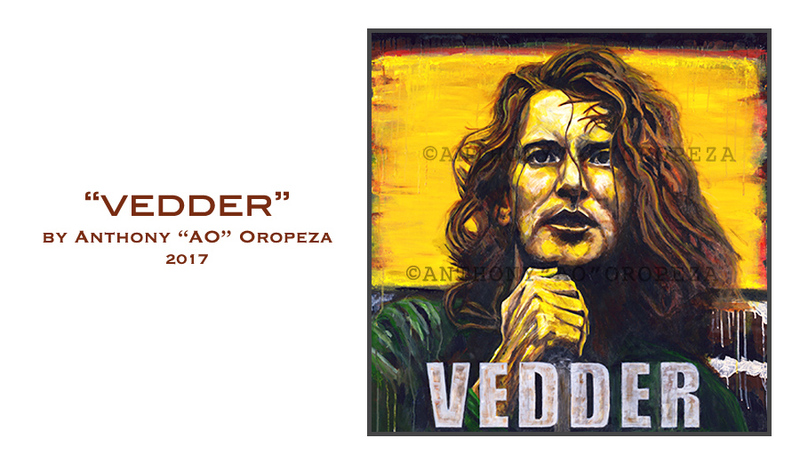 Oropeza’s “Vedder” it just another example of is his artistic range – sports, religious, music and more!